Visit the showcase site for 21st Century Astronomy. Education research shows that students learn by doing. 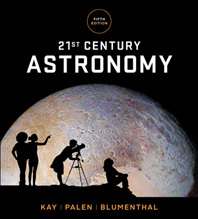 Influenced by astronomy education research, 21st Century Astronomy offers a complete pedagogical and media package that facilitates learning by doing, while the new one-column design makes the Fifth Edition the most accessible introductory text available today. The Fifth Edition’s interactive text and media package provides unmatched opportunities for learning by doing. Every chapter opens with a vibrant photo paired with a big picture question written to intrigue students about a phenomena and give them a goal for the reading to follow. New Reading Astronomy News sections provide a newspaper article or press release followed by critical thinking questions that train students to read the news critically and think like scientists. The questions are assignable in Smartwork5. 23 new Astronomy in Action videos created by co-author Stacy Palen can be used as pre-class activities via Smartwork5. A mixture of live demos and mini lectures explain key concepts in an understandable and compelling way, and the companion Smartwork5 questions allow instructors to gauge student comprehension and adjust their lectures as the results suggest. Exploration Activities at the end of each chapter get students doing science with a paper and pencil activity, or interacting with an AstroTour Animation or Nebraska Simulation. End-of-chapter Using the Web problems ask students to visit a website, collect information, “do” something, and then answer a series of questions. Smartwork5 provides additional opportunities for students to practice what they learn and instructors to assess their progress and understanding. Learning Astronomy by Doing Astronomy is a new activity workbook with 30 in-class collaborative activities. This workbook gives professors field-tested, easy-to-implement student activities to help transform any class size into an interactive environment that will engage students. Pre- and post-quizzes are available as clicker questions, as well as in the Coursepack. The Fifth Edition is rich with features that help students understand the process of science and become scientifically literate citizens. Each Reading Astronomy News box provides an article or press release accompanied by questions that encourage students to think critically about the science they encounter in the popular media. Unanswered Questions boxes pose questions that have yet to be answered and help students recognize that science is a process; we don’t know everything, and what we do know can change. Process of Science figures illustrate key discoveries, helping students visualize how science is done. Process of Science Guided Inquiry Assignments in Smartwork5 help students apply the scientific method to important questions in astronomy, challenging them to think like scientists. Smartwork5 is a visual, interactive assessment tool that provides students with rich answer feedback and hints that help them understand key concepts, while allowing instructors to track student progress. Pre-built activities and intuitive settings make getting started with Smartwork5 easy. Smartwork5 can be integrated with the most popular campus learning management systems, allowing students’ grades to flow automatically to the instructor’s LMS course. Every page of the Fifth Edition is open and inviting with a widened trim size and single-column text design, making 21st Century Astronomy the first astronomy textbook to depart from a dense, two-column format. 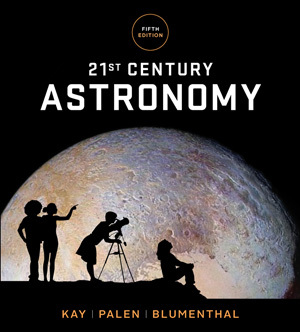 21st Century Astronomy includes Smartwork5, ebook access, and Learning Astronomy by Doing Astronomy, a workbook offering collaborative lecture activities that can be packaged with the text at no additional cost. For the instructor who is no longer interested in a print text, we offer Smartwork5 (which, if assigned, links out to the enhanced ebook) for less than half the retail price of a conventional text.